My beloved manuscript has been returned to me bleeding and broken after surviving a critique by a professional writer and editor. It has been an interesting and beneficial, if somewhat scary, experience. I have a better sense of the direction I need to take to fully develop the story. I take heart when I recall this. With the help of The Elements of Style, I know I can make the manuscript of Fred the Friendly Horse – The Almost True Story of the Fredblog better…stronger…faster. The kitty saga in my backyard continues. A few months ago, Mom-cat and her incredibly cute three kittens appeared in the backyard in search of food. They were wild and unapproachable. The kittens were about two months old, too old to be socialized. I began feeding them and with the help of a neighbor who is a dedicated member of the River City Feral Cat Rescue group, we were able to trap all four cats and get them to a veterinarian. All three of the kittens are female. After they were spayed, vaccinated, and dewormed, this wonderful neighbor kept them at her home until they recuperated and could be safely released. We released them in their home territory (my backyard). I feed them twice a day. They are still fairly wild, but they are much calmer and seek me out if breakfast or dinner is a little late. The bird population in my backyard is a lot happier too. I found out that there is an estimated 6,000 plus population of feral and abandoned cats in the city of 82,000 in which I live. As new kittens are born, the population continues to grow. Often suffering from various illnesses and facing starvation, these cats live short lives. If pet owners who allow their cats to live outdoors part or all of the time had the pets neutered or spayed it would help tremendously. Local S.P.C.A s and cat rescue organizations cannot deal with this problem on their own. I’ve noticed that AOL has a new feature on its web page entitled “Serenity Saturdays.” It features a picture of a woman (never a man) in a relaxing pose, cloaked in pastels, and usually near the water. The paragraph to the right of the picture proclaims “AOL and the Huffington Post want to help you reach serenity – the state of being free from stress or emotion.” There are several links in the paragraph. The second paragraph instructs the reader to “Visit AOL Serenity Hub every Saturday to find the info you need to self-improve and self-accept – so you can r-e-l-a-x.” Hummm. Sounds like a lot of work to me. Below the picture are the usual-suspect headlines. One that seemed especially at odds with the serenity theme was “Elderly Couple Used as Drug Mules After Winning ‘Vacation'” Nothing serene there. My favorite way of relaxing is to go to the beach. The pictures featured in this blog post were taken in September in Santa Cruz and Monterey County. California’s Central Coast is absolutely beautiful and a truly serene place to visit. Enjoy! 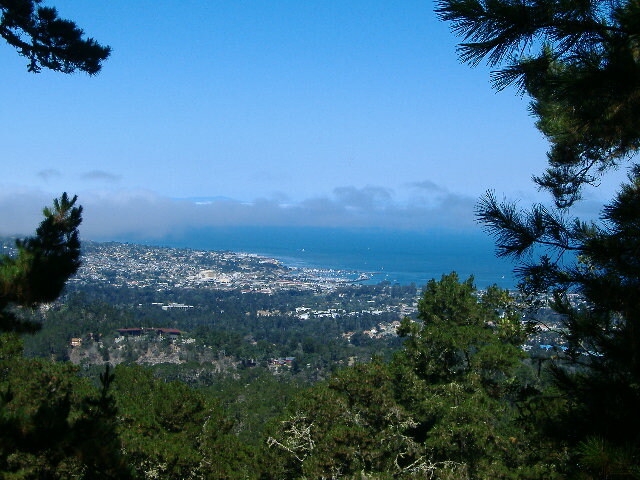 This is a view of Monterey Bay from the hills in Jack’s Peak Regional Park. A small day-use park, it has picnic areas and great hiking trails. During the rainy season you can find banana slugs on the trail. Banana slugs are large, yellow and impressive. They are also the official mascot of the University of California Santa Cruz. 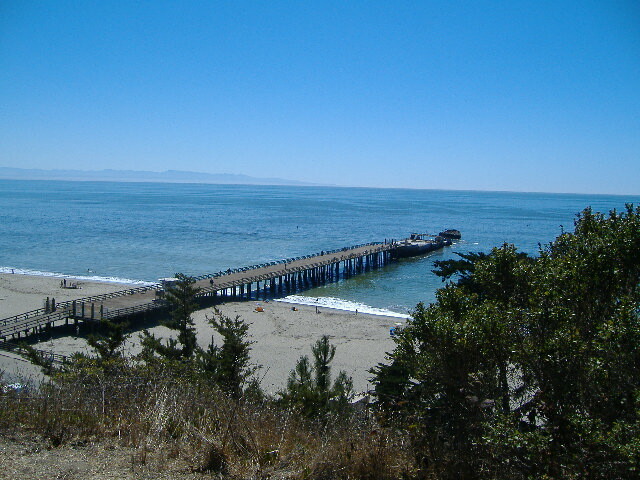 Seacliff Beach at Capitola has an interesting history. It has been impacted by storms several times over the years, but has always been reclaimed. 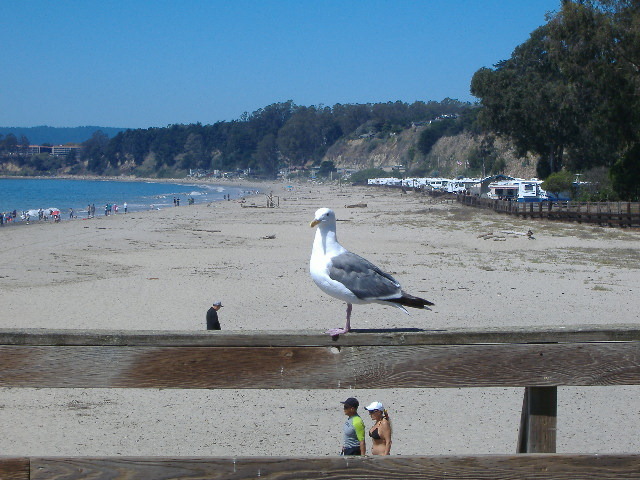 One year a storm at sea sent a group of migrating seabirds into the town of Capitola. These were birds that don’t usually land on shore. Their sense of direction was disrupted by the storm and many of them died. Alfred Hitchcock’s movie The Birds was inspired by their story. This is a very happy current occupant of the pier at Seacliff. No relation to the birds in Hitchcock’s movie. At the end of the pier at Seacliff are the remains of a concrete ship. The ship belonged to a private company. It was used as a bar, restaurant and live music venue for a few years in the late 1920’s. The storms that his this area damaged the ship and after a while it was closed. For a while it was a place for people to fish, but further damage made it too dangerous for use. It is now fenced off, although the seabirds do seem to like it. 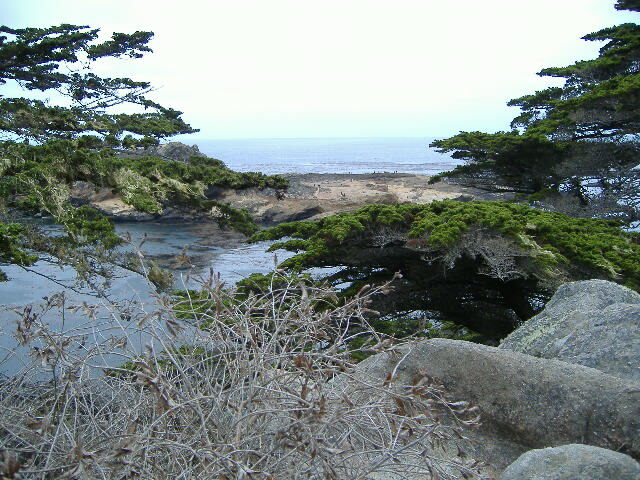 Some of the most spectacular scenery on the coast of California, Point Lobos has an active Docent program. They provide excellent information on the history of the preserve and can give you up to date information on what to see in the preserve that day. Each area has a different feel. There are quiet woods, away from the seacoast where you might meet some deer. The coastal areas include a former whaling station, a bird island that you can really smell when you are downwind, and rocky shores with dramatic crashing waves. In the spring fields of wildflowers abound. Professional photographers dot the landscape at any time of the year. Take a picnic and enjoy. What is your favorite way to relax? Trips to the beach aren’t always feasible and somehow I don’t find AOL’s Serenity Saturdays particularly relaxing. Vote in the poll and let me know.